The Antonov An-8 (NATO reporting name: Camp) is a Russian-designed twin-turboprop-engine high-wing light military transport aircraft. In December 1951 OKB-153 initiated the design of a twin-engined assault transport aircraft, designated DT-5/8 (Desahntno-Trahnsportnyy [samolyot] - assault transport aircraft), to be powered by two Kuznetsov TV-2 turboprop engines, and fitted with a large rear cargo door to allow vehicles to be driven straight into the hold. On 11 December 1953 the Soviet Council of Ministers issued directive No.2922-1251 to the Antonov OKB, requiring them to build a twin-turboprop transport aircraft derived from the DT-5/8. Bearing the in-house designation of Izdeliye P the resulting aircraft followed state of the art practice with a high wing carrying two propeller engines sat atop a rectangular section fuselage, tricycle undercarriage, with main gear units housed in pods either side of the fuselage, an upswept rear fuselage providing clearance of the tail unit for loading and unloading. After State acceptance trials production was not recommended due to poor spinning characteristics, directional stability and control issues, nosewheel shimmy, poor controllability when landing in crosswinds above 6 m/s (12 kt) and, last but not least, phugoid oscillations in all-three axes which were difficult to control and made piloting the prototype very tiring. As well as the aero-dynamic faults the TV-2 engines proved difficult to start with unstable gas dynamics at altitudes above 6,000 m (19,700 ft). 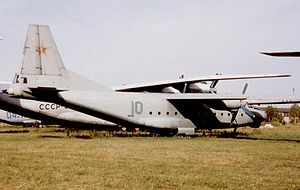 The Antonov OKB set about rectifying the faults with increased area vertical and horizontal tail surfaces, anti spin strakes on the upper rear fuselage sides, deleting the wing LE slats, local structural reinforcements and replacing the TV-2 engines with Ivchenko AI-20D turboprop engines, which had the added benefit of reducing the empty weight by 3 tonnes (6,600 lb). The new design required the use of new production techniques, like: stamping and forging of large high strength parts, extrusion of long sections, chemical milling of large skin panels and other new techniques. Given the service designation An-8, the new transport was built in the GAZ-34 factory in Tashkent, from 1957 to 1961, as a larger-capacity replacement for the earlier Lisunov Li-2 (DC-3), with a large unpressurized hold, a manned tail gun position, chin radome for navigation/mapping radar and a glazed nose for the navigator. The first production aircraft was rolled out in December 1958 incorporating de-rated AI-20D engines, (the initial production AI-20D was found to be incapable of delivering the specified power), modified undercarriage control system, fuel vents , pressurization and de-icing system, as well as thicker gauge skin in the propeller plane of rotation and increased rudder range of movement. Serving in the Soviet Air Force until the 1970s on front-line military duties, many were later transferred to Aeroflot for use as freighters and a few aircraft have been observed flying in Africa, particularly Liberia and Angola, despite Antonov having withdrawn the airworthiness certificate and support for the type in 2004, ending legal use of the aircraft. Izdeliye P - Antonov OKB in-house designation for the first prototype. Izdeliye N - Antonov OKB in-house designation for a projected airliner version with a pressurised circular section cabin accommodating up to 57 passengers. An-8 - The initial production version. An-8T - (Toplivovoz - fuel tanker/carrier) A fuel transporter used for all kinds of automotive fuels, as well as aircraft and rocket fuels including two 5,300 litre (1,100 imp gal) tanks for petroleum products, or a single 5,000 litre tank for rocket oxidizers like red fuming nitric acid (RFNA), nitric acid, or a liquid oxygen flask. An-8RU - (Raketnymi Ooskoritelyami - with rocket boosters) One aircraft fitted in 1964 with two rocket boosters to increase the single engined MTOW to 42 tonnes (93,000 lb). This project was abandoned after the crash of the first prototype during trials. An-8M - A projected anti-submarine warfare version developed in 1958. An-8Sh - (Shtoormanskiy - for navigators) A projected Navigator trainer. An-8PS - (Poiskovo-Spasahtel'nyy - search and rescue) A projected maritime search and rescue aircraft. An-8?? - At least one aircraft modified as a radiation reconnaissance aircraft with two RR8311-100 air sampling pods under the tail gunner's cockpit. One 23 mm cannon in the tail turret.